Wars are humanity despairing of itself. The stormy, fragmented months of World War I in Switzerland in the Cafe Voltaire. This was the gift of Dadaism. Hans Richter wrote an account of it. Jean Arp recorded some episodes. Both French and Germans participated, though the two countries were at war. Flesh gives birth to fleshwounds. Society gives birth to society. I think of Kirchner’s street scenes in grim colors forewarning of something about to take place. I think of his suicide, probably due to inability to cope with fascism. PhotoStatic magazine and Retrofuturism, the xerox-printed publications put out by Lloyd Dunn in Iowa City mostly during the mid to late 1980s, like Die Aktion and Der Sturm before them — this too was a time dark and stormy. I was living in Kansas and recall windy thunderstorms, lightning and tornados that curled through somber wheatfields. To would-be artists of those days the burning bush of copy shops spoke not in literary best-sellers, screen writing or newspaper hack-work but stubbornly in nonsensical, ad-hoc, unfettered collage. The motive was selflessness. The plan was to sacrifice recognition and payment to insure value. The straying moment did not speak in ringing prophecy but in hand signals in a silent, mirrored hall. The moment did not speak at all. It showed pictures made from a xerox machine. The watchers wondered from where the nomads had come. In that time something was born. But I’m not sure what. Perhaps it lived only briefly and then returned to its original state, an unformed impulse, a depraved notion. The xerox machine appealed to artists for many reasons. It seemed to create space rather than destroy it. As Dunn himself points out in PhotoStatic 19, the copy machine was not really a printing mechanism but a camera. He quoted Roland Barthes as saying that the basic quality of a photograph is ‘facthood’. The attraction then of having one’s writing photographed or one’s hand or one’s paperclips or one’s postcard or comic book might have been to prove its facthood, bring it into existence. But the xerox machine was a print mechanism in the sense that it was mostly intended to reproduce print. It was more professional at doing this than the inky mimeograph machine had been. You could make ten copies with the press of a button, enough to start a movement, probably as many as the number of copies of the original Surrealist manifesto. You could make ten copies of your face pressed against the copy machine glass, with your head squished under the rubber cover. This was high technology. You could enlarge or shrink — by percentages. You could make a booklet, with heavier paper and artwork combined with enlarged type as a cover. You could print on different colored paper. The whole process gave legitimacy to the troubled, meager poems it printed, not only because a photo was being taken inside but because type and print appeared on the surface. 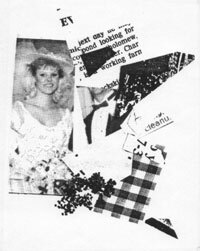 Some of the purely visual collages in PhotoStatic, such as ‘Bride of Xerox’, in no. 15, ‘The Persistence of Memory’, or the postcards in the double issue 25/26, ‘Networking’, came across with a faded, insubstantial texture reminiscent of discarded printing, newspapers in the attic. Often poor copy quality enhanced the sense of artwork. I believe that in this way the copy machine is largely responsible for producing what has come to be termed ‘visual poetry’ and ‘visual art’. It not only made collages look like print, it also made print look like artworks. It seemed to reveal the beauty of typewriter imperfections. It gave a textual Impressionism to everything it reproduced. It zoomed in on the visual qualities of print. It gave a writer who had his work copied a feeling of being published, of completion, so that one page of xerox seemed like an entire book. Contributors began to see the beauty of the texts themselves as opposed to what they were saying. A whole sense of the history of print and typography, of history of everything began to come through. The inner strength and qualities of the text suggested the inner workings of society. Stolid fonts seemed to have working class blue-collar virtues. Script denoted wedding invitations. Typographical graffiti seemed like the hieroglyphics of ancient civilizations. Most of the zines of that time were Dadaistic. They were a frolic of anti-conceptual collage and broken facades. But what remains from those is a scratchy, black-and-white image that never quite came through. An image of the writer’s dream to become published. To me it was the dream of publishing, not a thousand page book, but a booklet, something like an original issue of Poetry magazine. Something brief but prominent in the history of the arts. The ‘Compensation Portraits’ issue (no. 27) especially is like this, where Dunn made the cover appear as though it were National Geographic, a magazine he had always wanted to edit. Although the terms ‘visual art’ and ‘visual poetry’ were in use during most of the tenure of both PhotoStatic and Retrofuturism, it wasn’t until later that the idea was crystalized. Does that mean the antics of other artworks were a waste of time? Not at all. They gave worth to whatever was developing. Of course, many artists and writers contributed to many publications, most of which are now defunct. It was in Karl Kempton’s Kaldron that I first saw standing figures poling a skif on a reedy pool the surface of which was letters of the alphabet. But Dunn’s finely executed, self-effacing publications received most of my submissions. 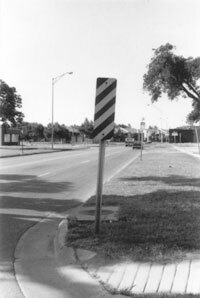 I find it striking in looking back that the purely visual images, without text in them, seem like text. They seem to cry out to be textual images, as though poised to disembody themselves and become texts — whether a particular statement or a textual vision I do not know. What is lasting from these pages? One might beg off from that question. Many things in particular seem valuable to me. But I think there is something principal. I think it is an ‘image’, a grainy textual and yet at the same time visual image that represents wandering humanity from the beginning of history until now. It represents all its efforts to understand and rule itself. All its struggles to account for its insane crimes and blunders. Its madness, its misguided sternness, its unbelievable wrenching positions, its foolish controversies, its appalling arrogant efforts to overdramatize itself, its cowardice and strange three-dimensional bravery. Its ‘Test Patterns of the Human Mind’, no. 28. All this seems to be present in these pages, sometimes looking backwards, sometimes looking around. It might be summed up by typewriter print, with words crossed off and revisions made, the typing paper smudged and wrinkled, perhaps scribbling over with ink, perhaps not making specific sense, perhaps making no sense at all, but still giving an overall feeling of intention, intelligence and sense. Of one finger typing, of someone attempting to communicate his or her thoughts. Though humanity’s record is somewhat checkered, though it is in a sense dead and ended; it is also alive, fast-moving, working, intelligent, able to accomplish tasks and overcome problems, looking ahead. It is an image that conjures a small group that still pounds wheat into flour for its main food. Though it is really nothing more than specks of dust in the wind or tiny dots on paper, it continues to survive. It exists like a bare fact. Wars are humanity fighting against itself. The Surrealists said this. But I mean against humanity itself. ‘It’s the opposite of everything it purports to be,’ wrote Harry Polkinhorn in PhotoStatic 21, ‘The Dan Rather Issue’, one of the best it seems to me. ‘Heads Or Tails’? Tom Hibbard has spent the past several decades in a time warp from which he has unsuccessfully attempted to escape by writing poetry, reviews and by putting together collages. Some of this work can be viewed on-line at Shampoo, Word For Word and Milk.